Fundraising is the lifeblood for many nonprofit organizations, but there is an art to it, and if you do not understand this art, your fundraiser will go from fantastic to failure. Some fundraisers are a little more obvious than others. A fundraiser to help find a cure for breast cancer is clear to most without further explanation. However, a fundraiser to raise funds to battle Chondrodysplasia Punctata disease may need more explaining. However, no matter how obvious your cause is, you still need a clear message that wins over the hearts of people. How specifically are you going to use the funds? What specific research are you using the money for? What results specifically do you hope for? Being specific will give people a greater sense of why your cause is important, but it will also communicate to them that you are serious. 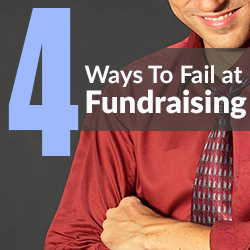 Anyone who has ever done a fundraiser in the past knows that fundraiser can be, and often are, extremely frustrating. Despite this reality, however, it is imperative to keep your fundraiser enjoyable. Few people will care about your cause enough to show up even though it’s boring. Creating a fun-filled atmosphere will not only bring your guests back in the future, but it will increase the morale significantly among your workers and volunteers. There is a fine balance between being clear and being pushy. Asking people for money is extremely challenging for most of us, but you need to realize that people realize that that is why you are having a fundraiser. They know that you want their money, so just ask for it. Now you need to use some common sense here. First you need to communicate to them why you need the money, develop in their hearts compassion and appreciation for what your cause stands for. There is a sense of “preparing” them for giving. However, you must be clear and just ask them to give. It’s amazing what people will do when they feel lead and not pushed. Urgency equals importance. If something can wait, then it must not be that essential. When you promote and launch your fundraiser you need to instill in the minds of everyone involved that what you are doing is vitally important and needs immediate action. Creating this sense of urgency will instill in the minds of your potential donors that there is no time for vacillating; they need to give now because your cause simply can’t wait. The world needs your cause now. Now, as I said above, simply expressing urgency won’t fly; you also need to give specific reasons as to why your cause is so urgently needed.